Written Mining for Ratings Stones by Bridger Cunningham. Another installation in 20th century ratings library is upon us, and what a better season to display than 1976-77. Within two short years, the television landscape added 10 contenders after striking a record low 23 sitcoms. 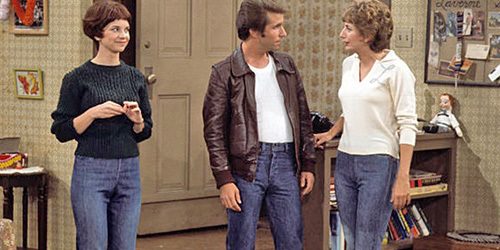 This season was also the first official time in its history where ABC was ruling the masses, thanks to the nostalgic powers of Happy Days and its spinoff, Laverne and Shirley. They were joined by a suggestive offering of Three's Company, which swept America via titillating controversy in 1977. CBS' relevance hits began looking tired, as All in the Family fell out of the top 10 (and out of 1st place) for the first time since 1971. The Mary Tyler Moore Show bid the airwaves adieu, sadly not in the top 30. And NBC suffered fatal blows as Sanford and Son was cancelled, and Chico and the Man was affected by the real-life death of actor Freddie Prinze.